Having a guitar playing son in my household, I know how often strings have to be replaced. I guess I never thought about the millions of guitar strings that musicians discard every year. But Hannah Garrison did. A trained jeweler, she’d been crafting them into bracelets for years. Then she responded to a classified ad on Craigslist posted by some guy named Steve Bernstein. He was a magazine publisher trying to figure out how to sell more ads to guitar string companies, so he was looking for ways to cleverly repurpose guitar strings. Hannah’s was one of 160 responses he received. An hour later the two of them met to form a company based on core principles of recycling and donating a portion of the profits to charity. They named it Wear Your Music. Today the company runs out of an old stone building in Woonsocket, R.I. Both Hannah and Steve donate their time, as do most of their part-time employees. World famous musicians donate strings (find your favorite guitarist) to be fashioned into unisex bracelets, which customers receive in a CD case gift box along with a certificate of authenticity. The proceeds of each original artist bracelet are donated to that particular artist’s charity of choice. For example, Anna Nalick’s donations go to Covenant House of New Orleans, Michael Franti’s donations go to Power To The Peaceful, Brandi Carlile’s donations go to the Looking Out Foundation, and Michael Kang of The String Cheese Incident directs his donations to Conscious Alliance. It’s also possible to order a bracelet made from your own strings. 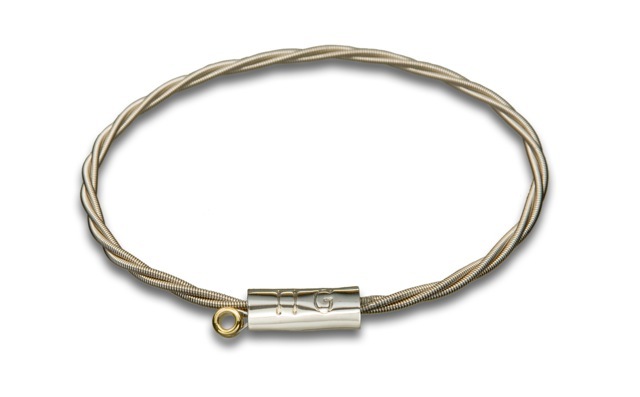 The most inexpensive options are handmade recycled guitar string bracelets without certification, costing $19.95. Wear Your Music also offers guitar picks made from gemstones, journals made from old album covers, and other innovative music-related items. I see major gift potential here.